Saint Michael Parish follows the requirements of the Archdiocese of Seattle, which outlines a two year Confirmation program that involves a proximate period of formation and an immediate period of formation. This proximate year of formation primarily takes place at Life Nights following the 5 pm Mass on Sundays. Your teens will participate in a teen focused Alpha course and a five week Theology of the Body session held on Monday nights beginning in April 2019. Attendance at both the Deanery Retreat (fall) and the Firefall Conference (spring) is required. For more information on the proximate formation year, please contact Abre Peters, Steward for Life Teen and Young Adult Ministry, at (360) 292-7106 or apeters@saintmichaelparish.org. After a teen has completed their proximate formation period and as long as they will be 16 on the day of the next Confirmation celebration, they are prepared to enter their immediate Confirmation formation year. This last year focuses on helping teens to understand what the sacrament is and the role the Holy Spirit plays in their lives. At the completion of this year, the bishop will lay hands on the child and anoint them with the sacred chrism oil during a special Confirmation Mass. They will then become “fully initiated” Catholics. For more information on the immediate formation year, please contact Jessi or Jamie Oakland at (360) 754-5515 or e-mail them at joakland@saintmichaelparish.org. Download the Faith Formation Registration Form. 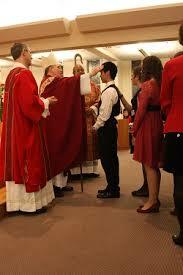 Please also download the Required Baptism Information for Confirmation form and submit it with your registration .